The Phoenician and Aramaic alphabets developed from this Proto-Sinaitic writing system. 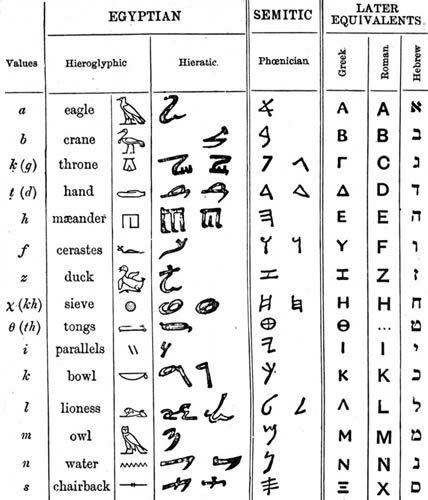 By the 8th century BCE, the Greeks had adopted the alphabet from the Phoenicians. Because vowels were more phonetically significant in Greek than in Phoenician, the meaning of five unused consonantal signs shifted to represent five of these vowel-sounds.8 The Greek alphabet was therefore the first to graphically represent both consonantal and vowel sounds, and thus this often considered the first true alphabet. Jacques Derrida also addresses the sign, composed of signifier and signified, in his book Of Grammatology (1967). For Derrida, however, each signified also serves as a signifier for some other object. For instance, the written word tree might be a signifier for the spoken word ‘tree’, which is a signifier for a physical tree, which could serve as a signifier for the idea ‘growth’, etc. This chain of signifiers and signifieds ends when a final signified, incapable of becoming a signifier, is reached. The end of this chain is pure objectivity, pure logos, pure presence. Derrida asserts that we currently live in an “epoch of logos”, characterized by the “philosophy of presence”, or a pre-occupation with the final signified and objective truth.17 This epoch began around the 8th century BCE with the advent of the full Greek alphabet. For Derrida, it was the development of a phonetically based writing system that introduced the very idea of ideal objects and scientific objectivity, and thus allowed for abstract thought and rational science (he borrowed this idea from Husserl’s Origin of Geometry).18 In Plato’s dichotomy of the intelligible and the sensible, Derrida interprets sensible objects as signifiers for intelligible objects, which he considers final signifieds. Alphabetic writing additionally made possible the existence of history and historicity. What Derrida proposes is an abandonment of the search for the final signified, for objective truth, as well as a rejection of the assumption that signifier and signified are equivalent. Rather, we should recognize that there exists an endless chain of signifiers and signifieds, which all vary slightly from one another. He calls this inherent variation between signifiers and signifieds differance (difference + deference). In other words, there are no pure ideas unmediated by language. Derrida’s suggestion that the alphabet was crucial to the development of abstract philosophy and modern science in the west is echoed throughout linguistic and philosophical literature. Robert K. Logan, in his book The Alphabetic Effect (1986), an expansion from an article co-authored with Media theorist Marshall McLuhan, argues for what he calls “the intellectual by-products of the alphabet.” These by-products are, “abstraction, analysis, rationality, and classification, which form the essence of the alphabet effect and the basis for Western abstract scientific and logical thinking.”21 They result from the fact that an alphabet is a digital system. In other words, it transforms data into characters that are arranged in a code [link], requiring one to constantly code and decode, while only memorizing a limited number of letters. However, many limitations to alphabetic script are often overlooked in traditional alphabet-based investigations, in what linguist Roy Harris calls the “alphabet bias”.24 The correlation between the graphic and the phonetic means that different languages using alphabets cannot share a common way of representing ideas, as is the case across language groups in China. Likewise, languages recorded in phonetically based script are separated in time from their own past forms, because pronunciation and vocabulary shifts are mirrored in writing. A modern Anglophone has difficulty reading Shakespeare, and is hardly able to understand Chaucer or Beowulf. Chinese speakers, on the other hand, can easily read texts dating from long before Chaucer’s time.25 The alphabet is not superior to other forms of graphic representation, but it does suggest a particular relationship between sounds and images that has significantly influenced modes of thought and modes of action in the west. 1 “Graphology,” in The Cambridge Encyclopedia of Language, 2nd ed. ed. David Crystal (Cambridge University Press: New York, 1998), 196-209. 4 Roy Harris, The Origin of Writing, (Gerald Duckworth & co. Ltd: London, 1986), 30. 6 Robert K Logan, The Alphabet Effect (William Morrow and Co. Inc: New York, 1986), 33. 8 “Alphabet,” in Encyclopedia of Semiotics. ed. Paul Bouissac (Oxford University Press: New York, 1998), 22-24. 10 I.J. Gelb, A Study of Writing (The University of Chicago Press: Chicago, 1952), 99. 13 Encyclopedia of Semiotics, 22-24. 14 Charles Sanders Peirce, “Logic as Semiotic: The Theory of Sign,” In Philosophical Writings of Peirce, ed. Justus Buchler (Dover Publication, Inc: New York, 1955), 102. 16 Ferdinand de Saussure, Course in General Linguistics, ed. Charles Bally and Albert Sechehaye. Trans. Wade Baskin (McGraw-Hill Book Co.: New York, 1965), 67. 17 David Potts, “The Continental Origins of Postmodernism.” Cyberseminar. 1999 <http://www.objectivistcenter.org/obj-studies/cyber/DPDerr.asp> 27 Jan. 2010. 18 Jacques Derrida, Of Grammatology (Johns Hopkins University Press, 1974), Ch. 2. 19 WJT Mitchell, “Word and Image,” in Critical Terms for Art History, ed. Robert s. Nelson and Richard Shift (The University of Chicago Press: Chicago, 2003), 52. 22 Jack Goody, Interface between the Written and the Oral (University Press: Cambridge, 1987), 56. 25 Encyclopedia of Communication and Information, 21-25. “Alphabet.” In Encyclopedia of Semiotics, edited byPaul Bouissac, 22-24. Oxford University Press: New York, 1998. Derrida, Jacques. Of Grammatology, Johns Hopkins University Press, 1974. Gelb, I. J. A Study of Writing. The University of Chicago Press: Chicago, 1952. Goody, Jack. Interface between the Written and the Oral. University Press: Cambridge, 1987. “Graphology.” The Cambridge Encyclopedia of Language, 2nd ed., edited David Crystal, 196-209. Cambridge University Press: New York, 1998. Harris, Roy. The Origin of Writing. Gerald Duckworth & co. Ltd: London, 1986. Logan, Robert K. The Alphabet Effect. William Morrow and Co. Inc: New York, 1986. McLuhan, Marshall (1964). Understanding Media: The Extensions of Man. MIT Press: Cambridge, 1994. Mitchell, WJT. “Word and Image.” in Critical Terms for Art History, edited by Robert s. Nelson and Richard Shift, 38-57. The University of Chicago Press: Chicago, 2003. Peirce, Charles Sanders (1898). “Logic as Semiotic: The Theory of Sign.” In Philosophical Writings of Peirce, edited by Justus Buchler, 98-115. Dover Publication, Inc: New York, 1955. Saussure, Ferdinand de (1916). Course in General Linguistics, edited by Charles Bally and Albert Sechehaye. Trans. Wade Baskin. McGraw-Hill Book Co.: New York, 1965.